The Geekwire podcast recording on March 21 at Gridiron Condominiums includes panelists Charlie Royer, Kevin Daniels, Julia Nagele, Moira Holley, and Scott Wasner. 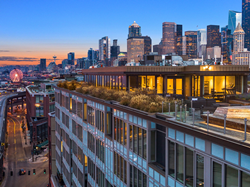 A multi-year, multi-billion-dollar transformation of Seattle’s waterfront is triggering a residential revival along the two-mile stretch that—until recently—was best known for the Alaskan Way Viaduct. Now with the elevated highway coming down, brokers say interest in living near the seaside promenade is rising. Holley is a listing broker on Gridiron Condominiums, a 107-unit mixed-use development in Pioneer Square’s Stadium District that reclaimed a century-old brick building and now hosts industrial-chic condominiums forged in concrete and glass and developed by Daniels Real Estate. Now more than 50% sold, Holley says the recently-completed building is well positioned to benefit from the emerging waterfront neighborhood. Royer, who described the new waterfront as Seattle’s Central Park, will be one of several panelists to speak to Geekwire and members of the FutureCast Forum on March 21st atop the Gridiron Condominiums. Other presents will include Kevin Daniels of Daniels Real Estate, Julia Nagele of HEWITT, and both Moira Holley and Scott Wasner of RSIR. You can RSVP here. The event will feature catering by Carmines, wines by Brown Vineyards, and other local business. Guests will be greeted by valet parking and offered tours of the property. A gallery-like showcase of renderings provided by the City of Seattle will illustrate the full vision for the waterfront as well as other projects planned for the community. The FutureCast Forum is a collaborative of opinion leaders that explores the current and projected market fundamentals and trends influencing the Seattle/Bellevue metro area by 2020 and beyond. Its founding members and guest columnists will provide timely insights on the state of the economy, commercial, and residential development, evolving demographics, wealth management considerations, government policy, lifestyle pursuits, and international catalysts that are shaping the regional landscape. Guests are encouraged to register at http://www.GridironCondos.com.